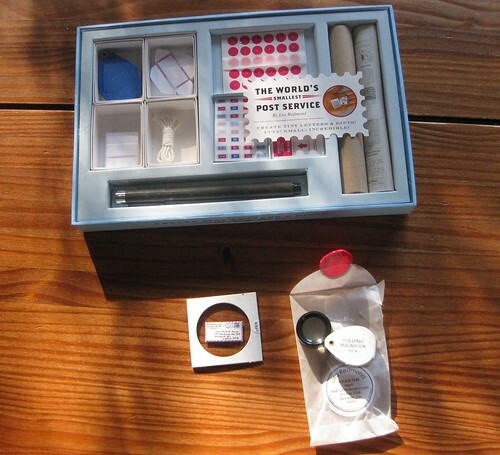 I got the most wonderful surprise gift a couple of months ago: my very own gratis World's Smallest Post Service, brainchild of Lea Redmond of Leafcutter Designs and manufactured by Chronicle Books. I have been aware of the WSPS for quite a while, as the Letter Writers Alliance has often touted Lea Redmond's magic, long before it was released as a collectible set by Chronicle Books. 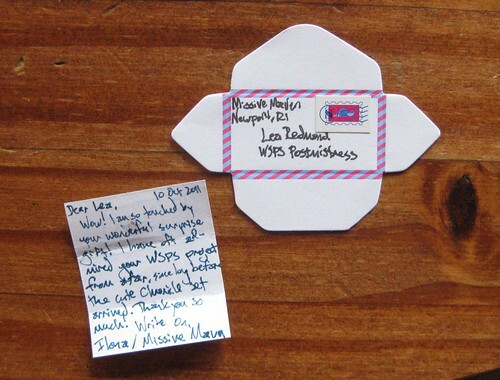 Along with my own free set of the WSPS to play with, I got this neato letter from Lea Redmond, WSPS Postmaster, herself. It came adorably sealed in one of those little cases - I know they have a name... what are they, film cases? 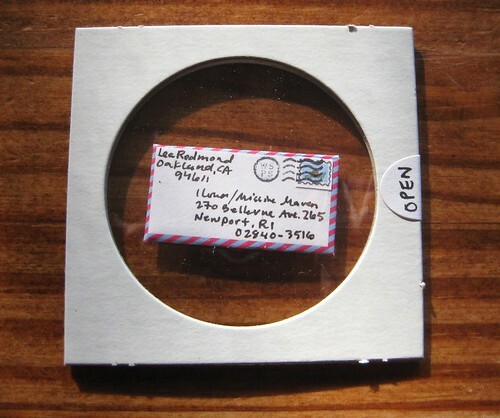 - with its own mini envelope seal. 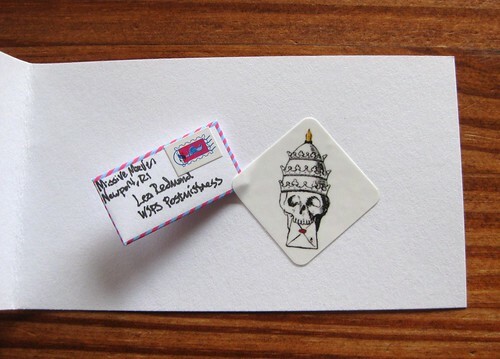 Oh my golly, how flattered am I that the WSPS postmaster and creator herself thought I needed one of these?!? So cute! 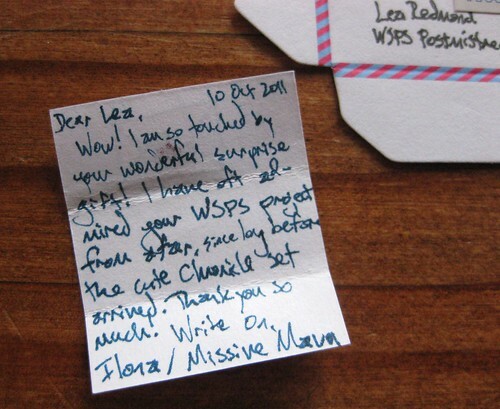 Of course I responded right away, with a mini-thank-you written on using the WSPS sent to me. Here's the array of writing utensils I used for the job. On the far right you see the pen that came with the set; it is unmarked, but I believe it is a Sakura Micron of some sort. I was surprised that it isn't all that fine... I have finer-tipped pens in my own arsenal already, so I used those instead. 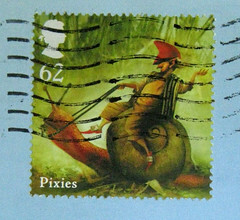 Here you see my tiny response with its tiny airmail envelope and very cute miniature postage stamp sticker. 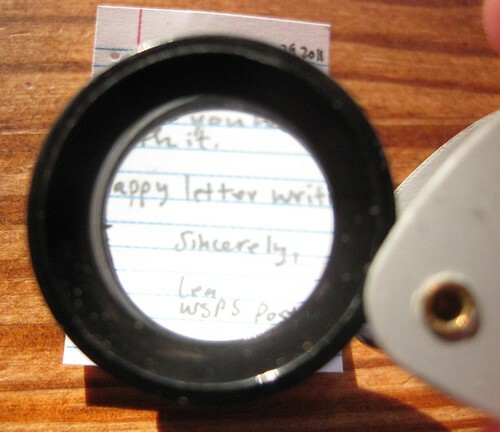 Here's a closeup of my letter. You saw in hers that she had quasi-notebook paper with lines and little holes, but the paper included in the WSPS set from Chronicle Books includes blank paper only. I was pleased with how well it took fountain pen ink, though, since my own needlepoint nib/XXXF Pelikan nib (special grind from Richard Binder) wrote finer than the black pen included. The tiny letters need their own larger encasing, so I used my beloved nib head skull design and stuck it inside of a larger card, to ride inside of another larger card. Is the set adorable? Yes. Would people who love tiny cute things love it? Absolutely. Would I ever have bought this on my own? Nope. 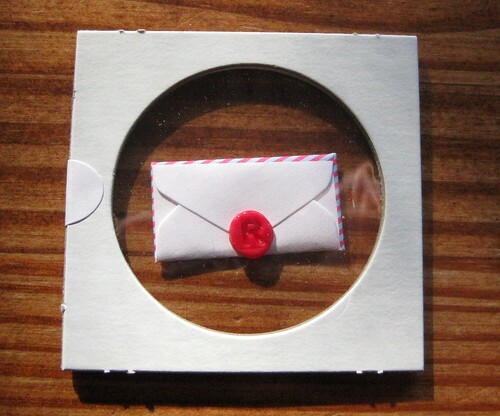 I'm not a tiny-cute-things lover in most cases, and to me its not terribly practical - I'd rather just write a real letter (again, not being a swooner over the miniature thing). Will I have fun with it now that I have one? Most definitely. Thanks, Lea Redmond and Chronicle Books! And the funny thing is, I'm listening to a radio interview talking about how many bloggers (fashion-specific, but still) don't bother to disclose when they receive items for free! Kudos to you, as usual, for having integrity and for being so awesome that people send you cool surprises for free in the mail! I've got a set, but I haven't used it yet. It's so cute! I'll have to give it a go. I think Lea is amazing with her tiny pieces. I am in awe of them. How fab' that you got this treat. 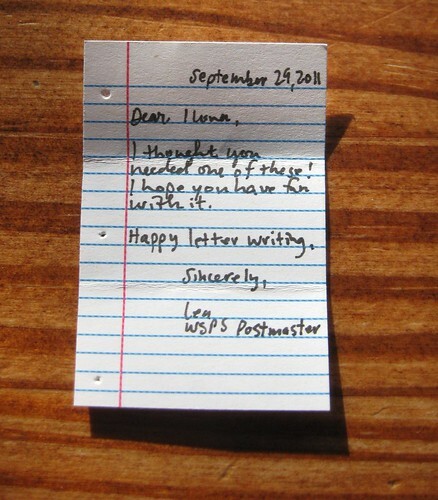 AND that you wrote her back a teeny tiny letter. 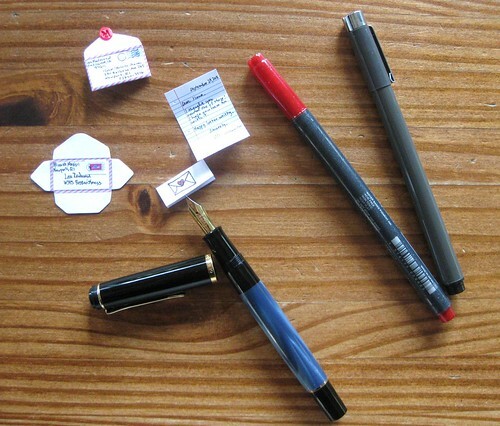 Now, I know what an XXF nib fountain pen is used for! Lovely!